A Massachusetts General Hospital (MGH) research team has developed a new female mouse model for the neurodevelopmental disorder Rett syndrome and in the process found evidence that relieving symptoms of the genetic disorder may require only partial expression of the normal copy of the involved gene, MECP2. 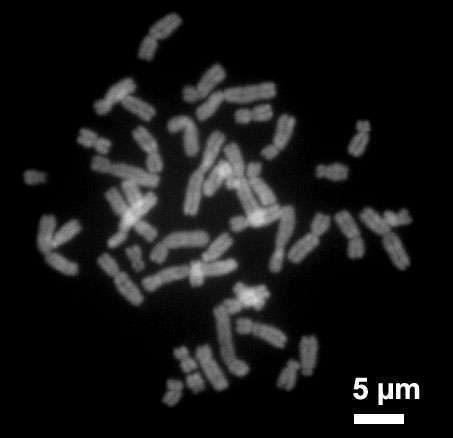 The strategy used in the study, reported in the journal PNAS, may be useful in developing models for other disorders caused by mutations on the X chromosome. "Developing an improved, easier-to-work-with female model for Rett syndrome is important, since the male models that have been used cannot fully replicate a disease that primarily affects females," says lead author Lieselot Carrette, Ph.D., a research fellow in the laboratory of senior author Jeannie T. Lee, MD, Ph.D., MGH Department of Molecular Biology. "Besides many more subtle differences between males and females that we don't yet fully comprehend, males obviously do not have a second, inactive X chromosome that we can target for reactivation as a potential cure." Rett syndrome is an X-linked disorder, caused by a mutation on the X chromosome. Females inherit two copies of the X chromosome, and in each cell one copy of the chromosome is activated—meaning the genes are available for transcription—and one is inactivated. Which copy is inactivated in a particular cell is totally random, so the effects of an X chromosome mutation depend on the cells in which a mutated chromosome is activated. Rett syndrome occurs rarely in males, as the MECP2 mutation typically emerges spontaneously in the reproductive cells of the father, whose X chromosome is passed on only to daughters. However, in those cases when a human male's single X chromosome does carry the mutation, the child is severely affected and rarely survives long. The MECP2 protein is known to be essential for normal neuronal development, and females with the mutation appear to develop normally for the first year of life. Their physical and cognitive development then slows and regresses, leading to symptoms including loss of mobility, seizures, lack of speech and social withdrawal. Affected females also exhibit repetitive behaviors such as hand-wringing and self-biting that can lead to injury. Females with Rett syndrome eventually require round-the-clock care, and the disorder is second only to Down syndrome as the most common cause of severe intellectual disability in females. Lee's team has been investigating methods of X chromosome reactivation to treat Rett syndrome and other X-linked disorders, and earlier this year they reported a first successful attempt at doing so by combining two methods—blocking both the expression of Xist, an RNA molecule that is key to silencing the inactive X chromosome, and the gene-silencing process of DNA methylation. While their approach produced some reactivation of the dormant X chromosome in cultured cells and a genetic animal model, the systems used in that study did not carry the Rett syndrome mutation. Lee explains, "This previous work enabled us to achieve an unprecedented level of MECP2 upregulation from the inactive X chromosome. A major goal of our present study was to develop a female mouse model that would enable us to test this drug combination in a living animal." The challenge with creating a useful female animal model of Rett syndrome stems from the random nature of X inactivation. Because the number of neuronal cells expressing the mutated MECP2 gene can vary widely, affected female mice often only develop some symptoms, which are usually mild and appear late in life. Such a model makes testing potential therapies more difficult, since whether or when symptoms develop could be the result of an animal's original MECP2 expression level and not the drug being tested. What would be needed is a female model in which the chromosome with the mutated gene was broadly and consistently activated. To create such a model, the MGH team targeted another RNA molecule called Tsix, which regulates Xist expression early in development when the silencing of one X chromosome is being established. Targeting Tsix could essentially "un-randomize" X inactivation, inducing more cells to express the mutated version of MECP2. The team developed two strains of mice with different Tsix mutations—one of which resulted in females with lifespans between those of the traditional female and male mouse models, a difference that was traced in part to MECP2 levels in the brain ranging as high as 20 percent of that seen in normal mice. In the other strain, MECP2 expression was reduced to less than 5 percent of normal, and those animals had significantly reduced lifespans and neurologic symptoms mimicking those of the male mouse model relied upon in most Rett syndrome research. "What was remarkable," Lee says, "was the therapeutic benefit observed in female mice in which MECP2 was expressed in only 5 to 10 percent of brain cells. The mice showed significantly extended life and reduced disease severity." Carrette adds, "Even small amounts of MECP2 expression appear to have big effects, which is very promising for the development of Rett syndrome treatments. Full reactivation of the inactive X chromosome might be difficult to achieve and have toxic effects due to a dosage imbalance of other genes. Partial reactivation could yield therapeutic effect while reducing potential side effects. The X reactivation approach would also be an alternative to gene therapy, which is challenging because MECP2 expression needs to carefully controlled, since too much leads to neurologic disease. Finding that not every cell needs to express MECP2 for therapeutic benefit indicates that a very low, safe dose could be effective." A professor of Genetics at Harvard Medical School, Lee says, "We are also excited that the new female mouse model appears to mimic the repetitive and self-injurious behaviors that characterize human Rett Syndrome. With this animal model, we will also be able to examine the efficacy of MECP2-reactivating drugs for symptoms that have been difficult to recapitulate in other disease models. We can now test our drug combinations using this model."